The end of the year seems to make everyone feel somewhat nostalgic and retrospective, looking back over the good things that happened in the past year. At the same time, we feel some sense of anticipation for all the yet unknown things that are yet to be. Right now, there are folks all over Internet-land sharing their best blog posts of the year. There are others making and posting their resolutions, or claiming their one WORD to represent their emphasis for the New Year. There are stories of big accomplishments and ambitious goals. I’m over here…like…I have no utter idea what to write. Here on the hill, one season just kind of slides into the next. Even when one project is finished, we’ve already got another one going and something else is moving up to take its place on our priority list. There is no actual finish line. It’s said that farmers are always thinking ahead at least three seasons (and I can personally attest to that)…maybe that’s why it seems like nothing ever ends around here. Our New Year’s Eve will be fairly similar to New Year’s Day…and even the Thursday following it (and the next Friday, Saturday…Sunday…) There won’t be any late night parties or big-time celebrations. I’ll be doing the late night/all night thing during lambing season and I need to “pace myself”. We didn’t have any big changes here on the hill. But, all the talk of past accomplishments and learning opportunities got me wondering just what did go on around here in the past year. Looking back, 2014 was a pretty good year. Lambing season was successfully un-eventful. THREE sets of triplets really helped our reproduction stats. (even though it did mean some extra work) And, we only ended up with one lamb in the house! (that was only overnight) This year’s lamb chop crop was perhaps the most delicious in our history! Here are a couple last season's lambing posts. We had a colder March than anyone could remember and it did truly affect sales for much of the season. There were no strawberries to speak of this year. And, tree fruit was virtually non-existent. (not just us, the entire Valley had a peach and apple shortage) The cucumber and squash plants FROZE twice. I am certain that the Boss and I spent hours covering (and uncovering) broccoli and onion transplants. But, we actually sold MORE fresh broccoli than ever before. And, we still have onions for sale. (go figure) And, the Brussels sprouts did extraordinarily well, despite Gus and his propensity for destruction. Did you read this one? I did a week-long series for Farmers' Market week that starts HERE. Summer was what summer always is around here…a somewhat chaotic, frenetic dance of planting, harvesting and sales. The temperatures were below average, although it was still plenty hot when I was out there picking (picking, picking, picking….) green beans. …and before we knew it, it was fall again. Then, Market season was over. With the end of the Market, our attention turns to other things. Like home improvement and getting all that filing done before tax time. We are both still admiring our flooring job and wondering why we didn’t go ahead with that project YEARS ago. (and I actually finished the filing!) I also completed my second year of blogging every day in November. Did you read "30 days of Lessons from the Farm" ? In late December, we always take time to have our annual “corporate” meeting. Since our space is limited, real estate is at a premium, those frustrating, problematic crops need to be eliminated and so other more sure-fire items can take their place. We don’t make these changes lightly, but our sustainability and profitability are more important that growing every single vegetable possible. Our review and revisions in place, we are ready for the arrival of 2015. After taking an inventory of the seeds on hand, it’s time to make those big orders for the growing season, while trying to keep some focus on the “off-season”. All our winter-time customers are looking for spinach and lettuce and anything green, so we will do our best to satisfy them (to some degree) despite the cold, dark winter days that are sure to come. To that end, one greenhouse is cleaned and organized and I’ll be sowing lettuce and spinach later today. Cleaning the other greenhouse and working in the hoophouses may just be the way we start the New Year. Because…well, the cycle of life, y’all. There is always something to seed, plant, harvest (or weed) around here. See what I mean about one thing just sliding into the next? 2015 promises to be a year to remember. 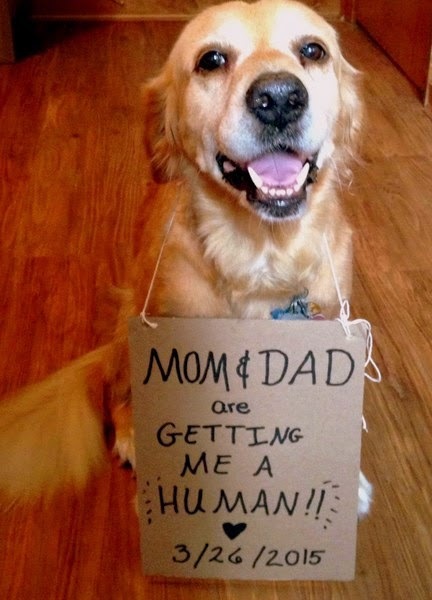 This is due in part to this exciting news posted by our eldest daughter and son-in-law's dog. 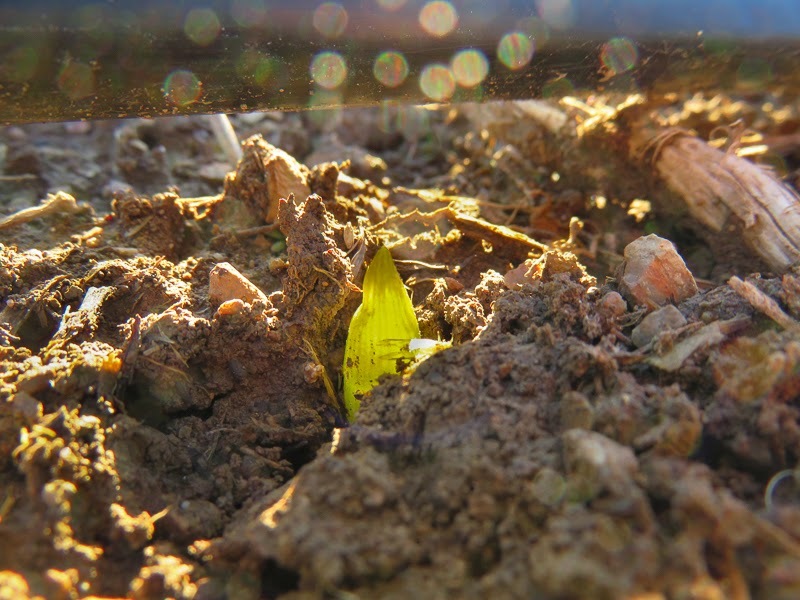 While our becoming grandparents doesn’t directly affect the farm…it DOES affect EVERTHING! Congrats to our kids! (and Savannah, the dog) We are so very happy and excited. 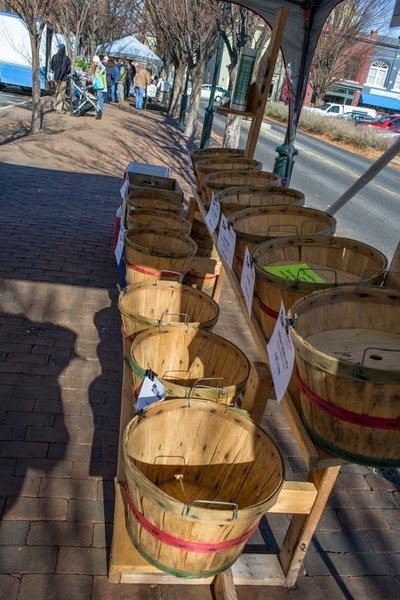 Soon there will be lambs and chicks and little seedlings…the sun will shine and the sky will rain (hopefully) and we’ll head off to our 18th year as Market vendors. 18 years…I truly cannot believe it’s been that long. …and all that it may hold. I honestly can’t wait to see what lies ahead. any guesses as to how many lambs...? Thanks to all of you who have read along with me in 2014! I hope you'll keep following and commenting. …well, not quite…I think the season officially changes at 6:03pm Eastern time. Other than a few very early morning snowflakes, there’s no real obvious signs of the change in season. It’s been looking fairly wintry for a while now. But, the days will start getting longer tomorrow and someone somewhere will start the countdown to Spring. This time last week, the weather guys started talking about the possibility of a huge winter storm. And, I must say, that possibility colored my thinking for the entire week. Not to mention what effect it had on our plans for the week and weekend delivery. I will spare you my soapbox dissertation on the “issues” of snow on the farm (and business) and just be quietly thankful that the forecasters were wrong, wrong….completely wrong. Hooray! If you thought last week here on the hill was something…then I’m sure you will find this week completely "scintillating". (spoiler alert---it was BORING, really BORING…and I’m used to our “non-exciting” lifestyle) It's not that we didn't do ANYTHING...just repeats of the same old, same old. But, the floor is officially done. Neither one of us can get over the fact that it's so beautiful...and it's finally DONE! When I said I was on to “other things” I meant that I got the task of putting everything back in order after the construction job was finished. That entailed a lot of cleaning and re-organizing and asking (out loud) WHAT in the world did we save THIS for? We (I) tend to save things that look “useful”. And, while this often comes in handy around the farm, it can be problematic when attempting to keep the household organized. It looks like a trip to the dump is looming large on the horizon. Somewhere in all the organizing, I got a new vet box (which I hope to stock today) in anticipation of lambing season. It's just around the corner. Have you ever wondered WHAT is in my vet box? For that matter what IS the vet box? Well, here, read this one. I’m pretty sure we are well prepared for lambing, but it is always good to get a complete inventory supply with some time to spare. This week, we’ll work the ewes and make our final preparations. The Boss will get the jug pens arranged once we finish feeding out the extra hay and we have a little more room. Can you tell I’m looking forward to lambing? It’s rather like Christmas on steroids…totally exciting and thoroughly nerve-wracking (and always over far too soon). This week had very little excitement (seriously, it was even duller than last week). The dog went to the vet, again. (somehow, she had never gotten one of her shots…don’t know how that happened, but we’re good now) But, I did get to visit with my favorite vet for the first time in a couple of years, so that was good. We talked for a bit and I think he misses our cows, too. Then, I ended up making TWO trips to the feed store (in my preparation for the non-existent snowstorm) But, that meant that I got to visit with the hay guy (and the missus) and that was one hilarious conversation. I’m still laughing. Despite the weather forecast and the lack of strong sunlight and the cold of December…there was actually stuff to pick for this week’s delivery! While it was not as much as I would have liked to have…and nowhere near enough to satisfy ALL our customers (I’m pretty sure that is impossible anyway) we had another good week even though it was really COLD for our pick-up. Sales for this December have been at an all-time high. We are incredibly thankful to have such great customers. We’ll spend some quality time in the hoophouses this week in an effort to keep greens production going throughout the winter. 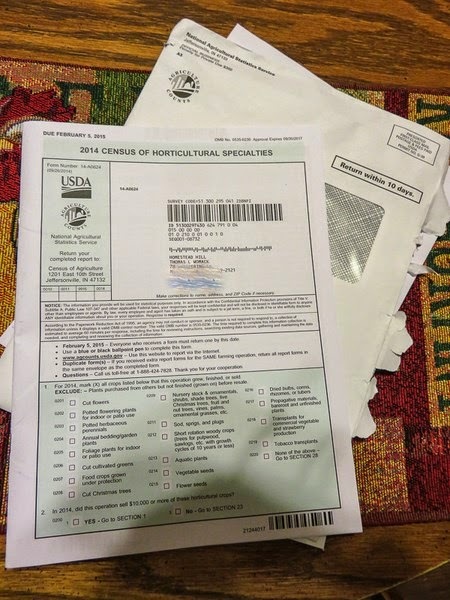 The mail brought the Census of Horticultural Specialties from the USDA and NASS. This 28-page form needs to be completed and returned in relatively short order. Filling out this type of paperwork (it can be done online) is time-consuming and may seem unnecessary to some. And, I admit, my first thought was not “oh, joy…more paperwork!” But, I’m just nerdy enough to appreciate all those facts and figures in one place. When all the reports are finished and the results tallied, it is amazing to see just what goes into Ag production around the nation. And, yes, I do plan on sharing some of those facts and figures with you. Agriculture (and all it's many facets) is just astounding. Another “truly scintillating” week on the hill. Do read the sarcasm in this sentence. Thanks for stopping by! Come see us again real soon. I love talking to the neighbors. You generally learn something new about farming or the neighborhood. You see things from a new perspective. Or at the very least, you hear something amusing. If you’re lucky and talk with the right neighbors, you get all three in one conversation! Some time ago, we were talking to the hay guy (and the missus). They nearly always come as a duo, and generally have two conversations going at once; she will interrupt her own story to correct his (and vice versa). They are a wealth of local knowledge and truly amusing to boot. Honestly, I could talk to them all day. …and sometimes, that nearly happens. We were discussing farming and history and how things are done. “Waaalll, I don’t do that one no more...” was uttered more than once. Until the hay guy grinned a little sheepishly and said “Waaalll, it don’t sound like I really do much at all, now does it?” and he chuckled at himself. He’s been farming a long time. His family has farmed here for many generations. He’s seen trends come and go. He’s tried things and knows what does (and does NOT) work for him. He’s asked and answered all the hard questions about life and farming. …and he’s okay with the fact that he’s getting “up there” in years and has to conserve his time, his energy and his resources if he wants to keep on farming until he’s called to his reward. I’m certain he knows what exactly he needs to do to keep his farm and farming efforts sustainable. With all the talk of sustainability today, I don’t know if the folks tossing the word about have ever thought about what the word really means and how it plays out on the family farm. Sustainability is “the ability to continue a defined behavior indefinitely.” A simple, elegant (somewhat flawed) definition. Indefinitely? Is it possible for anything to continue indefinitely? 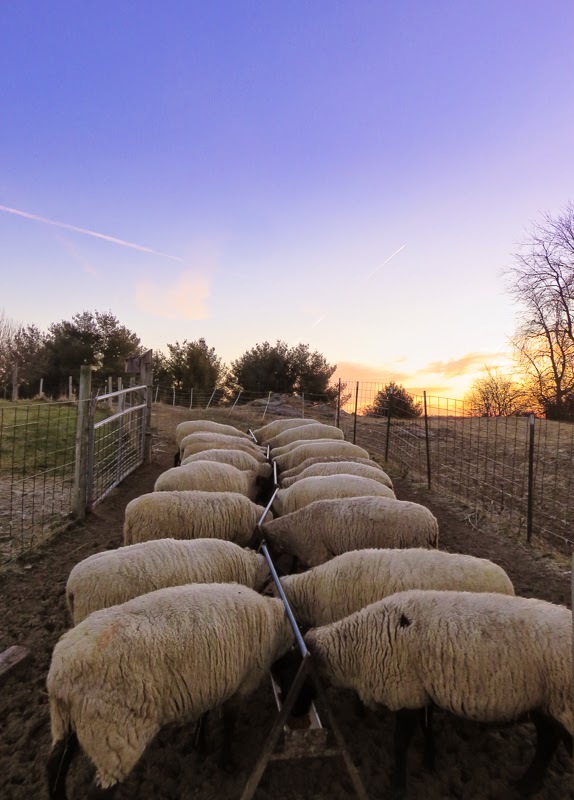 While it would be every farmer’s desire to “continue indefinitely”, circumstances often dictate change of one kind or another (in order to continue farming) which may seem to run counter to the definition. Over time, a farm evolves, taking into consideration weather changes, public demand, unexpected life events and even health issues. These lead to the introduction of new crops, different methods, labor-saving devices (and practices) and possible diversification. As the farming population ages, work-arounds to accommodate health and safety concerns become issues as well. And, when the next generation takes over, things really change although the farm itself remains a sustainable entity. At the end of every season, it’s time to take stock and ask ourselves the hard questions as we prepare for the next year. Is this really worth it? Are we being good stewards? Does this method actually work? Is there demand? Can we continue this method/crop for the long-haul? Are we still satisfied and happy? Do we have the strength (physical/mental/emotional) to keep on keeping on? Could we be better? (that would be better stewards, better workers, more organized, better marketers...the list goes on and on) These are just some of the questions we have to ask ourselves, rather than simply hoping we can be “sustainable”. Sustainability is the ability to continue. It doesn’t mean no inputs, no matter what you might read on-line. Fertilization and pest control are essential to continued growth and food production. The methods used for both are reviewed (often) and changed, particularly when there are options that are less toxic and/or more effective. It also does not mean clinging blindly to the “old ways” or just the things our grandparents would have remembered. …and there’s always that little matter of profitability… I know there is a growing trend to think that food should somehow be produced for free…but, if farmers aren’t able to pay production costs, there is no way the operation can be sustainable. These are hard questions. Tough considerations. Sometimes changes must be made and those don't come easy. We aren’t the only farmers reviewing these subjects. Over the years I have been greatly impressed with the great amounts of hard-earned knowledge possessed by those in the “humble profession”. And, I am not exaggerating when I say hard-earned…any success is only possible by the (very literal) “sweat of your brow” in the farming world. A lot of thought and soul-searching goes into farm decisions. Years and years ago, when lots of young folks headed out to “the big city” it first began to become difficult to find farm help. So, many farmers switched to round bales when making hay. This was a big deal. New and different equipment meant the face of farming changed forever. The small squares had become the norm and many still use them. (although, you must remember that even baling was “new technology” at one point--- before that hay was just stacked loose) But, far more acreage can be cut and baled using a round bale system in a timely fashion, and doesn’t require near the man (or woman) power. And, cows really don’t show a preference for the shape of their meals. The change allowed farmers to “continue on indefinitely”, although hay season began to look far different. Our own desire to “continue on indefinitely” meant that there have been times when we had to stop, re-think and change directions. While I truly loved my cows, when it came to profitability, it just wasn’t happening. Raw milk sales are illegal in our state. (and raw milk consumption is a topic for another discussion) With a couple of cows on a small acreage, becoming a licensed dairy wasn’t an option. Bootlegging is not appealing and jumping through the hoops or circumventing the law was either too expensive or time-consuming to keep what were essentially gigantic pets. Making milk soap was fun and even though we sold a fair amount, it wasn’t enough to justify the added work and expense. Wintertime is our time for review and revision. Those cold, gloomy days are perfect for assessing the past and planning for the future. (and keeps us from falling asleep next to the warmth of the woodstove) There are numerous crops, some methods and more than a few ventures that we have discarded over the years. And, there are always new things to consider. So, whether it’s looking at earnings figures…(I do love my Quickbooks), discussing the failures and frustrations, or taking note of the successes… we have to be willing to ask the hard questions and perhaps even say “Waallll, I don’t do that one no more...” on occasion in order to “continue on indefinitely”. Let’s hear it for asking (and answering) the hard questions and the quest for farming sustainability! ...and where IS my breakfast? Around here…there’s not a whole lot to report. We spent the vast majority of the week on our knees. …and we were not praying. When I said we were working on the big flooring project, I really meant WE were working on the big flooring project. No contractors, no helpers, just the Boss and me (and our trusty knee pads). After years of use and abuse, it was beyond time to fix the floor. With our autograph in place for future generations...we began working on the floor. the hole-y floor is gone forever! I'm pretty proud of that cut around the toilet! For right now, the ewes are just hanging out, eating and growing the lambs that will start arriving in just about one month. Next week, we will spend some time getting the barn and the sheep ready for the new arrivals. We got some new heatlamps and hopefully they live up to our expectations. I’m really looking forward to lambing…that’s when I finally get to see if those breeding choices I made work out like I thought they would. can you see the hens out there working? The crops in the hoophouses are slowly…slowly growing. The frosty nights have slowed things down considerably. There are numerous plantings that I had hoped I would be picking by now that are still just sitting there, under the frost blanket…waiting for a little warm sunshine. Crop re-growth is very slow and somewhat unpredictable this time of year, although it does happen. The weeds in the hoophouse, on the other hand, are growing profusely. It’s just not fair! If I could just convince everyone that the weeds are truly tasty (and they really are) we’d be set. However, the hens would miss their greens and we still wouldn’t have enough greens to satisfy our customers. (and chickweed is hard to pick nicely) So…we’ll just stick with the status quo. While there hasn’t been a whole lot of action to note around here this week, the skies have been amazing. I’m sure there is some explanation for the beautiful skies of December, but I’m not privy to it…so, we just enjoy the light show. 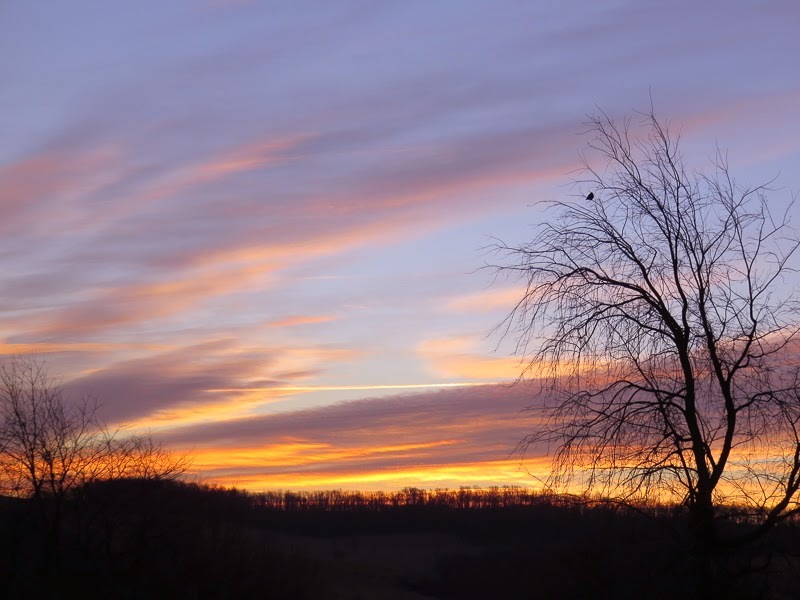 Thursday’s sky was particularly noteworthy, there were Facebook posts from all over the area. 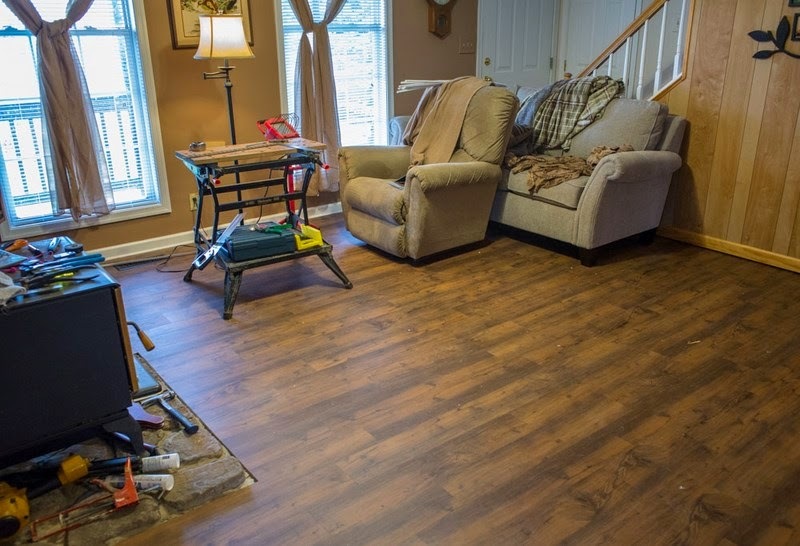 In the midst of flooring, we did indeed get out winter sales email sent out and the responses flooded back in. Wow! Week two was even bigger than week one! And, despite the fact that we NEED more lettuce…and a lot MORE spinach (I’m trying…y’all…I’m trying! ), everyone seemed happy with their purchases. Our customers are great! We’ll take a little break today, although the Boss has to finish up some trim work and I have to do some clean-up, laundry and bake some bread for the upcoming week. We’ll get back to our farm work and floor job later. I will also be writing to the FDA (did you read THIS?) I know I’m cutting it close…the deadline for comment on the FMSA is December 15th. That's TOMORROW! I’d say that maybe we’d have some exciting news next time…but, quite honestly…excitement is not something we want here on the farm. Excitement generally means something unexpected happened…and unexpected is generally not a good thing. So, personally, I really like dull…and predictable. While it doesn’t make for real interesting reading, it does mean that all is well and going according to plan. You know…no news is good news. Oh, wait...there was some news. Sort of. 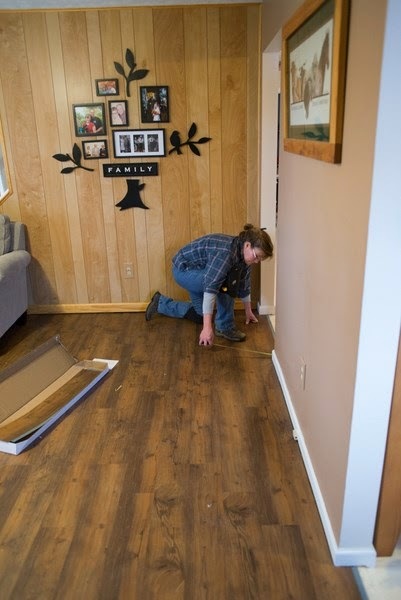 We had snow, sleet and freezing rain...which melted fairly quickly, but did add a bit of "interest" to the flooring job. Where did the cat go, Gus? Then, there were the "extreme free-ranging" chickens. About a dozen hens found a hole in the fence and were checking out the farm. A short, intense chicken-roundup followed. And, that, my friends was the totally uneventful week on the hill. Thanks for visiting! Come back and see us again real soon.